Each year, our civilization pours around eight million tons of plastic into the ocean, a portion of which ends up in the bellies of fish, and by consequence, our dinner plates. New research suggests that at least one species of fish isn’t ingesting this plastic debris by chance—they’re actually attracted to the smell. 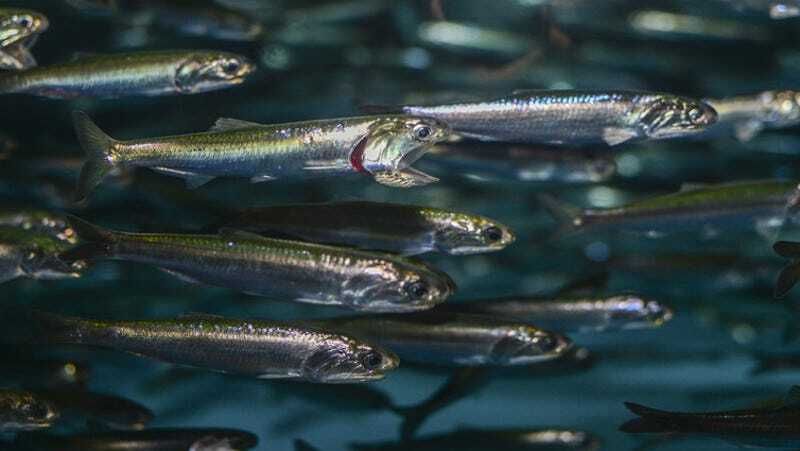 The Northern anchovy (Engraulis mordax)—a common schooling fish found off the North American west coast and a critical part of ocean food chains—consumes plastic because it smells like prey, according to new research published yesterday in Proceedings of the Royal Society B. Given the ecological importance of these marine animals, this discovery hold serious implications for the well-being of aquatic food webs, and quite possibly, human health. Smell, also known as olfaction, is important for fish. Some sharks can sniff out tiny amounts of chemicals associated with their prey, and salmon use their olfactory abilities to navigate up rivers to their spawning areas. Other fish use smell to hone in on prey, for mating, migrating, and foraging. Unfortunately, as NOAA postdoctoral fellow Matthew Savoca has shown in his new study, this sense of smell can backfire for anchovies, who find the scent of plastic irresistible. For the experiment, the NOAA researchers required cold, fast-flowing water and schools of at least 100 individual anchovies. When in this configuration, the fish swim slowly in the direction of water flow, but when they sense the presence of food, their behavior changes markedly. Savoca’s team worked with the Aquarium of the Bay in San Francisco to replicate these conditions. To test their hypothesis, the researchers soaked seawater for several hours in either krill (tiny shrimp-like crustaceans that anchovies like to eat) or plastic debris. Armed with a GoPro, the researchers observed changes in behavior when the anchovies were exposed to either the krill-infused seawater, plastic-infused seawater, and unscented seawater (the control). Using a combination of automated computer analysis and observer scoring, Savoca’s team evaluated how tightly the schools clumped together, and how the body of each fish changed before and after adding the flavored seawater. These observations show two things—that Northern anchovies use their sense of smell to locate food (which, surprisingly, hadn’t been proven before) and that plastic debris is confusing to anchovies, who seem to interpret it as food based on its smell. Moving forward, scientists will need to determine if other fish are engaging in these plastic-eating behaviors, and if these plastic-derived contaminants are being transferred from plastic-eating fish to fish-eating humans. In the meantime, we should all stop using single-use plastic items, and recycle our plastic instead of throwing it in the garbage.